One of the great pleasures in food is plain old unpretentious good food. I could spend my whole life examining good down home cookin' and still be finding great new things as they're ordering my casket. I am lucky enough to live in an area that seems to have a great appreciation for both the adventurous foodie extravagances as well as the simple pleasures. Even in those areas where you won't find a hamburger on a menu without listing the variety of grass the cow ate, there are often simple pleasures in foods to be found in the back alleys. One of my favorite simple pleasures is a nice breakfast or brunch out. There is something special about heading down to the local greasy spoon for way too much coffee and a denver omelette. Certainly there is something divine about the food, but another key element of the experience is recovering from the previous night... or looking at the other people recovering from the previous night. There is a whole other category of just plain good and that is the establishments that shoot very high and very directly for being just plain good. One example of this is a bakery in Oakland, California called Bakesale Betty. I have on numerous occasions described the baked items from this place as 'perfectly imperfect'. In describing them as such, I am referring to the visual, not the flavor. The tastes to be found at Bakesale Betty are consistently excellent. The baked goods here are not about the thinly sliced intricate fruit tarts so many fancy bakeries sell, rather everything that comes out of this place is like that perfect item you made that one time... There is something heartwarming about seeing the perfect imperfections in the scones, cookies and pies made at this place. An example is that with the pies, you'll find some of the pie filling that bubbled over, but not in a messy way... just in a way to show that they weren't made by a machine. Bakesale Betty also sells incredible sandwiches that also hit a home run in the 'just plain good' category. The one to try first is certainly the fried chicken sandwich. It comes on a nice roll with plenty of fried chicken (with plenty of chicken, not just fried batter) and a mountain of cole slaw. The cole slaw itself is great, with a little jalapeno and marinated onions... and it's good that it stands on its own, because there's such a mountain of slaw in this sandwich that some of it inevitably falls out and begs to be 'cleaned up' after finishing off the sandwich. Now, being in Oakland, with the general availability of chicken and waffles for breakfast, the only problem is that this sandwich is only available for lunch! Sweets are a part of just about every culture. It is always a lot of fun when traveling to explore the candies, cookies and deserts available. I've seen something of a renaissance occurring in the US where it comes to candies particularly, and more specifically chocolate. When I can go into a run-of-the-mill grocery store and see chocolate bars from around the world with creative flavor combinations, all is right with the world. 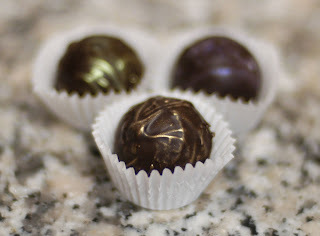 A friend was kind enough to bring some chocolates with liquid caramel from Sahagun Chocolates in Portland, Oregon. These caramels were quite an experience. Apart from being beautiful to look at, they were a fairly unique eating experience as well. In some ways, these can be challenging as they are not your typical chocolate covered caramels. These are salted, and not entirely subtly so. The salt is not overpowering, but while I've had salted caramels a number of times and they've gotten much more popular, many are not accustomed to a pronounced salt flavor with their sweets. This is really the brilliance of it all however. The salt balances out the sweet and brings out additional flavors. Beyond the flavor, the rest of the experience was exciting as well. I was told specifically that the caramel was to be eaten in one bite. The caramel inside the chocolate was an unexpectedly thin liquid. I would compare it to a cordial cherry without the cherry, but perhaps a bit thinner. The lack of density of the liquid is really what allowed the strength of the salt to work. If it had been thicker, perhaps the flavors would not have integrated as quickly and the last taste would have been salt... but it all worked together quite nicely. Food, like many other subjects is filled with choices that impact the experience. Occasionally everything comes together into a perfect experience, but more often than not, there are choices we must make to trade one element of an experience for others. This is something that is done not only by us as consumers of food, but also by the people creating our experiences. Flavor... Does it taste good? Presentation... Does it look appealing or visually interesting? Ethics... Is this a good fish to eat? Service... Is that waiter ever going to come over here? Atmosphere... I eat under a drop ceiling at my desk, but do I really want one when dining out? We all have our priorities and certainly some, like food safety, can trump the rest of the experience. My preferences tend to lean in the flavor direction over all others. I can deal with peeling wallpaper and sneers from waiters if the food is good. I was confronted with the choice between these when I had a several cupcakes recently. 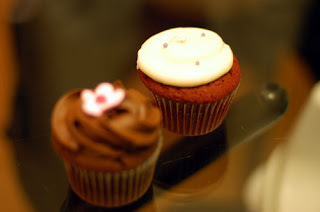 First, I had a couple cupcakes from the Teacake Bake Shop in Emeryville, CA. Many elements of this place are very well done. The presentation of the cupcakes is strong, the storefront is well designed. Good service. Admirable ethics, with donations to important causes like the Breast Cancer Research Foundation. Unfortunately where the experience fell apart was with the cupcakes themselves. They were dry. By contrast, soon after, I had some cupcakes made by the Cake Ladies. I got these cupcakes from a table set up in a driveway. The cupcakes were not as 'cute' or with the same attention to detail as the Teacake Bake Shop ones, though visuals are fairly subjective. Certainly the experience lacked the professionalism of a storefront. However, these cupcakes were moist and excellently flavored. 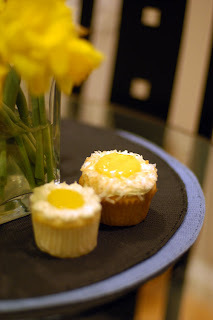 In this case, with lemon curd and coconut. Tangy and well balanced. Overall a great cupcake. Want to get one for yourself? I found mine around the corner from the Temescal farmers market in Oakland. I don't eat a lot of steak. I probably have more steak overall in burritos and tacos than I do as a slab of meat. When I do have steak, it tends to be a pretty gluttonous event. Such was my last steak. I was in Las Vegas and it seemed appropriate to have a steak while I was there. 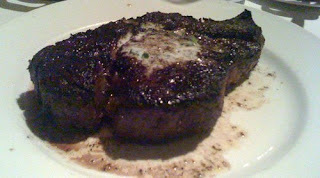 I stopped in at Delmonico Steakhouse in the Venetian. I always wonder what to expect when I go to a restaurant that is 'owned' by a famous chef, in this case, Emeril. In this case, the experience was quite positive. The host was a little stand-offish for my taste, but you gotta cut them some slack, they're working schedules for hundreds of people a night, right? Once we got to our table, it was pro service all the way. It's the little things, like the waiter noticing you're in the middle of a sentence and standing for a few moments a few paces away before approaching. He was very accommodating of our questions, recommendations, and ready-ness to order. 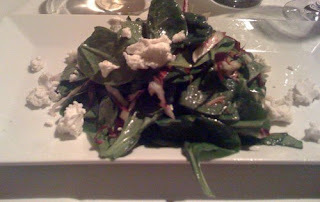 I started off with a salad with goat cheese. It was a little over-dressed, particularly because the greens were very good, but still very enjoyable. I tend to go for rib eyes over the fillets and they had a highly recommended bone-in rib eye, so I ordered that, medium rare. 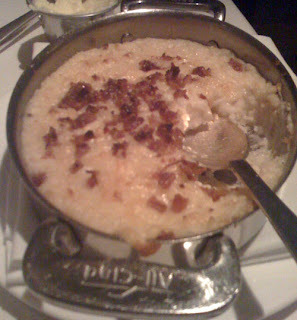 Also ordered a side of Bacon Cheddar Grits (remember what I said about gluttony?). 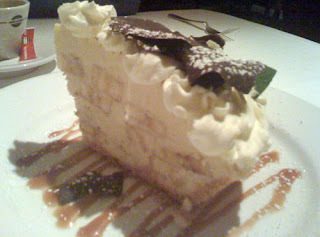 I wrapped it up with a (shared) banana cream pie and espresso. 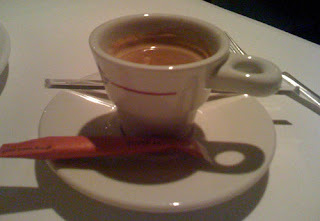 Of note and fascination to me was their options for different espresso beans with different flavor characteristics. I can see, if looking forward to a long night, doing a little tasting of their varieties. Overall an excellent experience. While I don't believe the best value (particularly steak) is always in the fine dining venues (of which this is one), this is a restaurant that is not just window dressing, the quality and service are there to go with the environment. It's one of those cravings that builds up every now and then. Sometimes called buffalo wings, spicy fried chicken wings with the occasional drumstick thrown in every now and then. I've tried wings around the country and as with many foods places that have a unique appreciation for a certain food, often also have the best examples of that food. Sure, it's possible to stumble across an amazing example in the middle of nowhere, and I have, but if you want a safe bet, upstate New York is the innovator and still the place to go for a great example of wings. I've had great wings in New York, Texas, Colorado, California... Prepared in many styles from traditional buffalo wings style to Asian style. Wings are a great example of how opposing forces in a food can really make that food work. Wings are just a laundry list of opposites shoved together, beginning with the sauce. This is really the basis for the flavor of the wings, the combination of vinegar (sour) and cayenne (hot). Often restaurants serving wings will provide options for how hot you want your wings to be. This is one area where we've seen significant push in the area of food challenges, with many establishments offering flavors like "Thermonuclear Meltdown". These flavors were not meant to be enjoyed, rather to show your ability to handle the heat. The true price really being paid over the next couple of days. Another element of opposition to be found in wings is the texture. While dripping with the sauce, the wings should also retain a bit of the crispness they've gained during their bath in the deep fryer. It's a subtle thing, but something often not present on wings that have been all too often sitting too long in their sauce. Wings are typically served with blue cheese dressing and celery sticks to help take a bit of the edge off of the spiciness of the sauce. This also provides options for flavor combinations... go ahead... dunk that wing n the blue cheese! Some of my favorite wings? Certainly there are a number of great places in upstate New York. I also frequented a good wing place in the Park Slope area of Brooklyn. There is also a place in my heart for some wings I had in Grand Junction, Colorado. I'll always remember these wings. They brought them out covered, put down the plate, and lifted the cover. 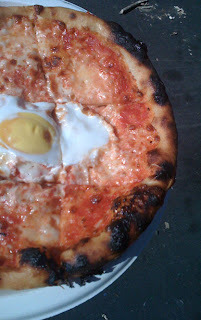 The spicy aroma burned the nose and made the eyes water, a sign of good things to come. I recently stopped off at a local franchise of Wing-Stop. My expectations were not very high, but I had been craving some wings and thought I'd give it a shot. In the end, I was pleasantly surprised. Perhaps I caught them on a good day or before the slide that inevitably happens with franchises, but the wings were quite good. I do think they could go ahead and throw in some blue cheese and celery without an extra charge, but overall a decent experience. I had the Original Hot and the Hickory Smoked BBQ flavors. Both were very good, with my preferences being the original hot. I look forward to heading back to try some of the other flavors.